If you are considering adding a shrub to your garden next year, think about elderberry — a native plant with unusual foliage, creamy blooms in spring, and berries that are incredibly healthful. What’s not to love ? Elderberry (Sambucus canadensis) is a native shrub or small tree, hardy to USDA Zone 4. It produces blue-black berries in large bunches late in the summer. The berries are bitter when raw, so they are generally consumed in a syrup, jam or wine. If you do not use the berries, don’t worry. The plant is popular among a variety of songbirds, who will happily eat them for you. The berries are full of antioxidants (Vitamin C, A and B6, as well as potassium and iron) and are said to help ward off colds and flu. The elderberry has a large flat flower in spring. While cooked berries are good for you, the stems, leaves and unripe berries are toxic to humans. The berries may be the reason many people grow elderberry, but this is a good looking plant, too. The leaves look similar to Japanese maples, and some northern gardeners plant elderberries to look like a Japanese maple tree. 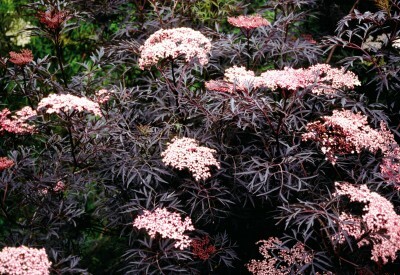 The variety ‘Black Lace’ elderberry (Sambucus nigra ‘Eva’) even has the dark foliage of a Japanese maple. 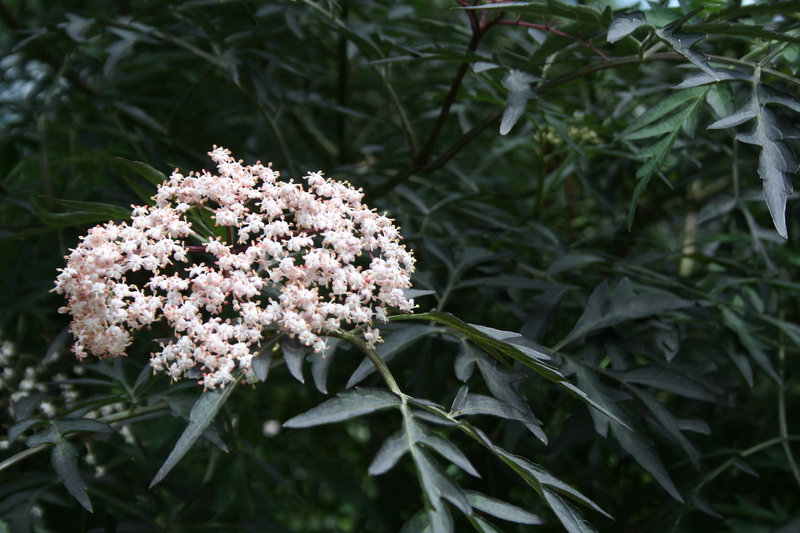 Black Lace elderberry has dark maroon foliage and a pink bloom. Photo courtesy of Bailey Nurseries Inc. The shrub grows 5 to 12 feet tall and wide and in ideal conditions, it can get out of control so this is a good plant for those who love to prune. While elderberry can tolerate poor soil, it prefers a full sun to partial shade site with adequate moisture. Giving the plant enough water appears to be the key to success with elderberry. You can buy elderberry shrubs from many nurseries and they should be planted in spring. Make sure they receive plenty of water, especially as they are getting established, and do not prune them or pick berries for the first two years. A dose of high-nitrogen fertilizer or organic compost helps the shrub grow better. Because it needs moisture, adding a layer of mulch after it is planted is a good idea. Elderberries are susceptible to a few pests, including spotted wing drosophila, which has been discovered in some Minnesota counties in the past few years.